Hi all! 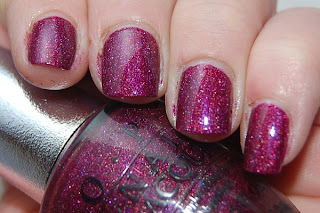 I'm not a fan of half-moon manis, and that's what day 18 of the challenge is... I've been dreading it!! 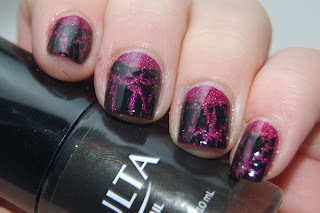 OPI DS Extravagance with some Ulta Quake on top! I am fairly happy with the results. May I present my ABSOLUTE favorite color I own? Love. it. For the holidays, Zoya did a crap-ton of flash promos for free and cheap things. I had never before purshased a bottle because the cost is just a tad killer. However, when I first saw a B1G1 color box, I thought I'd step in. That makes if $4 a bottle with $2 shipping? Can't complain!! One thing you will learn about me is that I have a Massage Therapy license, and only recently found out that I can get a cosmetology discount with it. Helooooooo cheap polish!!! Zoya.com is fabulous, and gives the cosmo discount! I snagged it all for TWO DOLLARS a bottle! I went a tiny bit overboard with my purchasing.. 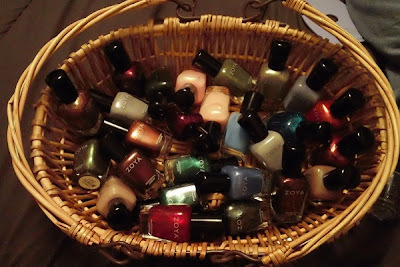 In total, I spent $92, but was able to get 40 bottles of polish out of that!! $12 was shipping for 6 different orders. I gave away a great deal of that for the holidays (and more soon for a party I am having!! Details soonish). This is what I got! Aside from Nina, which was hiding, and various others I gave away, this was my haul!! Here's the full list of what I purchased. Day 16 of the Challenge - Workin' on those cuticles!! Every night I look at my cuticles and realize that I picked at them during the day again. They certainly are better now then they were six months ago, but it's still driving me nuts! Anyhow, ignore them! Here's the tribal patern nails. I think this is about what it was going for. 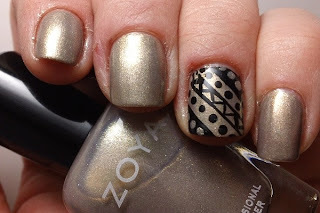 Two coats of Zoya - Jules, with Sinful Colors nail art for the lines. I'm in love with Jules! So, any tips on better lighting? It's all up to the lighting with these shots, as the only camera I have is a little Sony Bloggie I picked up on a trip once. It was free, beggars can't be choosers. I'll certainly work on that...Until then, just enjoy the art! There you have it. Now I will post all of my nail art, hauls, etc here! You can rest easy, facebook friends. SHOUT OUT to the RedditLacqueristas seeing this right now! It's you ladies that keep me going strong! I apologize, I've never owned and operated a blog before, so here's to a success!! 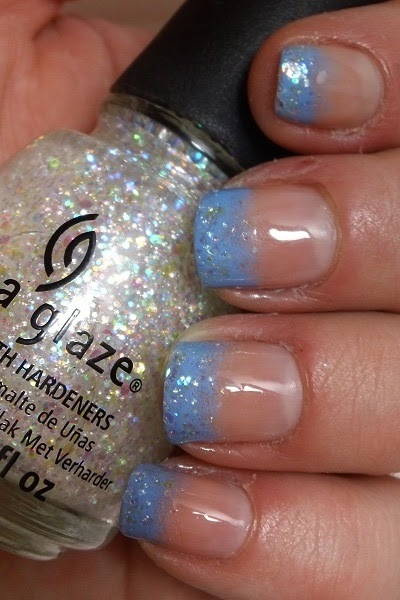 I am going to go ahead and start off with my Day 15 of my 31 day challenge, seeing as that is the mani I just did!!! Delicate Print today! Two coats of Sally Hansen's Xtreme Wear - Grey Area, one coat of Pure Ice - Busted, stamped with SH Quick Color Purple Chrome pen. That being said, I will get the entire 31 day challenge up at another point in time, perhaps when I am done? Not sure..We'll see!